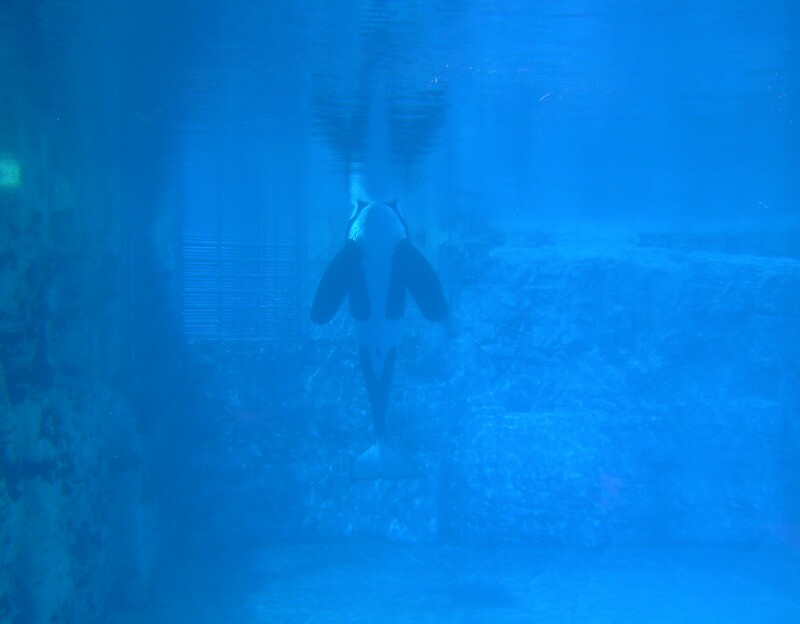 According to the Port of Nagoya Public Aquarium, a necropsy (animal autopsy) has found that the female killer whale “Nami”, who died in January 2011, had 491 stones weighing 81.4 kilograms (179.5 lbs) in total stuck in her stomach. As we reported HERE the 28-year-old female orca became sick and was losing weight in late December 2010 and passed away on January 14, 2011 nearly 7 months after being transported to Nagoya from her home of 24 years at the Taiji Whale Museum. The facility announced that Nami died from Fungal Bacterial Pneumonia, Stomach Ulcers, Myocardial Fibrosis, Heart Failure and Chronic Colitis after swallowing the stones over the course of many years at the Taiji Whale Museum where she was on public display in part of a natural cove. There are no stones in the pool where Nami was kept at the aquarium in Nagoya. (See video of her in the little cove she frequented during her life in Taiji. And also this video, it clearly shows she is bored out of her mind. 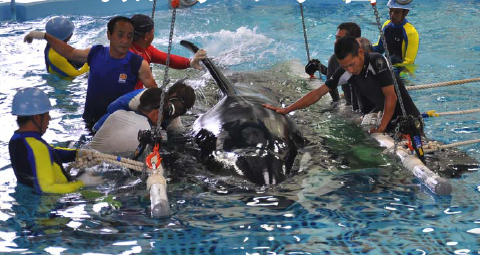 The Port of Nagoya Public Aquarium teamed up with external experts to further examine what caused Nami’s death and review how killer whales should be raised in captivity. The results of their findings were presented by a team of veterinarians at the Asian Zoo/ Wildlife Histopathology and Parasitology Conference, hosted by the Asian Society of Wildlife Pathology and Parasitology. 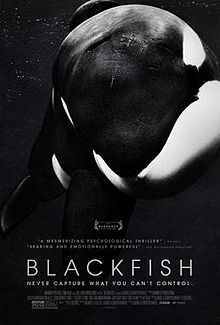 They concluded Nami’s death was a case of pulmonary zygomycosis with Cunninghamella bertholletiae in a killer whale (Orcinus orca). 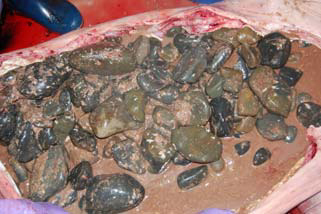 This case represents the first documentation of zygomycosis associated with C.bertholletiae in a marine mammal. Cunninghamella bertholletiae (Cb), is a saprobic fungus commonly found in the soil of temperate climates and infection is a rare cause of pulmonary zygomycosis. It is typically isolated in pulmonary bronchial isolates only as a contaminant. However, in immunosuppressed hosts invasive infection can take hold. Below, you can read the full results of this review and see additional photos or you can open/view/download the report by clicking HERE. Presently, there are no orcas living in Taiji. In December 2011, 29-year-old male Bingo, 25-year-old female Stella, and her 4-year-old daughter Ran 2 were transferred to the Port of Nagoya Aquarium from Kamogawa SeaWorld in Japan. The transfer for breeding purposes separated Stella from her two other daughters; 13-year-old Lovey and 9-year-old Lara who were left behind at Kamogawa. It was initially expected that Bingo would breed with Nami at the Port of Nagoya. marine parks should not keep captive orca (and other dolphins). taiji fishermen, who regularly capture and slaughter entire pods of dolphins, held this orca for decades… to me that’s just deplorable. why doesn’t people like Jen wonder why we have to hold these beings against their will instead of asking questions about euthanasia? I don’t know where you got the idea that just because I asked a simple question that I somehow pro captivity?. I’m not. I’m 100% anti cap. Are anti cap’s not allowed to ask questions now?. I think its disturbing that I know of no orca that has ever been euthanized ( correct me if i’m wrong). These animals are so expensive and make them so much money, they would rather see them suffer and continue to perform than put them out of their suffering. junior left in a kidie pool in a shed for years because he was unwanted. keiko suffered skin complaints for years. If they were any other animal they would have been put to sleep to end their suffering. There was an orca that was euthanized while being held for acclimation during the Icelandic orca-catching operations in 1980’s. According to William Johnson’s “Rose-Tinted Menagerie,” an orca was caught by Jon Gunnarsson’s crew was actually hoisted from the water by its tailstock, still caught in the net. Either this or during the capture attempt it somehow broke its back, and it was taken to the bankrupt Saedryasafnid Zoo. Obviously it did not fare well, since three weeks later, they called in a dentist to shoot it. So, it broke its back, yet thet still let it suffer for three weeks? and why a dentist not a vet or zoo keeper? The orca capture operations were done without much public notice, even paying off Reykjavik’s police to keep it secret. Why they let that poor animal suffer, I don’t know, but the capture operators there (Specifically Helgi Jonasson and his animal dealing company Fauna) had a mentality that orcas were just big fish, nothing more. Plus, the Saedryasafnid Zoo was bankrupt before the 1980’s, I believe, so there were no zoo workers. Just the fishermen who held the capture operations, a few trainers ( former SeaWorld San Diego trainer, Jeff Foster [under the alias Jim Jefferies] was the one training the orcas at Fauna abefore they were sold), and marine park representatives. And a visit or two by British vet David Taylor whenever the poor animals suffered from extreme frostbite. The Japanese government and aquarium owners don’t give a toss about public opinion inside or outside the country. At this very moment, they are off whaling for “scientific research” in the Southern Ocean Sanctuary and it is only the perseverance and intervention of the Sea Shepherd Society that is drastically reducing their kill quota. The daily slaughter of dolphins continues unabated in Taiji despite the international outcry generated by the documentary The Cove. So I wouldn’t hold my breath for any action on this front. Thank you TOP for posting this interesting and sad story. Here is another one from 1990 related to a deceased whale named Kanduke. Although not blamed for Duke’s death, a navigation buoy was found in the orca’s stomach during the necropsy, and like Nami, it couldn’t have benefited his health. Although SW denied the buoy was theirs (and didn’t cause his death) these objects are often used as play toys for captive orcas, who typically live in a relatively featureless environment devoid of stimulation. Kanduke, being the lone transient at the park, was not culturally related to any of the other whales. He died of viral leptomeningitis on 9/20/1990. It was suspected, unofficially, that the infection was delivered by a mosquito (bite). Thanks again for the information. This is so sad. I hope they don’t replace Nami with other killer whales. She suffered enough throughout her life and it would be selfish of the aquarium to replace her. Russia has announced it plans to catch ten orca from the wild this year. Japan also will try to catch five wild orca, one of which is rummered to be replacing Nami. Lets hope they dont succeed eh. she committed sucide, what else could she do? shame on humans,we don´t deserve this life. Sono d’accordo, sono in pericolo. Siete fortunati ad avere non orche in cattività nel vostro paese. Si prega di assicurarsi che essi non iniziano i delfini che permette di essere messo in serbatoi di entrambi. Ho sentito dire che è nelle opere in Italia, e sperare che non accada mai. This shows that these beautiful and highly intelligent animals can get depressed. Just like us humans. Terrible, the death of such a sensitive creature! Captivity kills. This is plain and simple. When will we learn?? Orcas do not belong in captivity!